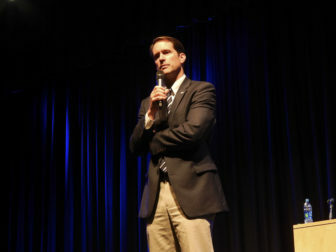 U.S. Rep. Jim Himes answers a question during a Westport town hall meeting in 2017. U.S. Rep. Jim Himes and Republican challenger Harry Arora on Monday night presented two different views on how the United States should treat friends and foes around the world. In their third and final debate, hosted by the World Affairs Forum at the University of Connecticut’s Stamford campus, Arora often defended President Donald Trump’s foreign policy, including his protectionist “America First” campaign. “The America First policy is a balance between American interests and values,” Arora said. Himes, meanwhile, continued a longstanding criticism of some of Trump’s foreign policy moves, including what he called the president’s “love affair” with North Korean dictator Kim Jong-un, and said the “America First” policy would weaken the United States through isolation. “I see nothing but the president providing comfort to dictators,” Himes asid. The hour-long debate pitted Himes, a Rhodes Scholar who has represented Fairfield County’s 4th congressional district since 2009, against Arora, a hedge fund owner with an MPA from Harvard who emigrated to the United States to pursue graduate studies at the University of Texas. While Himes is kept up to date on the world’s hot spots through classified briefings as a member of the House Intelligence Committee, Arora also proved to have broad knowledge of foreign affairs. One difference was that Arora was much more eager to support Trump’s idea that the United States could pressure the world’s dictators to do our bidding though “leverage,” instead of international diplomacy. The Republican from Greenwich agreed with Trump’s imposition of tariffs on China and many U.S. allies. Himes said the tariffs are hurting U.S. businesses, including a local beer brewing company that has to pay more for aluminum cans because Trump imposed 25 percent tariffs on much of the imported metal. “They are worse than ineffective, they are counterproductive,” Himes said of Trump’s tariffs. Himes also said nations targeted by tariffs have imposed their own countervailing duties on U.S. goods, which has hit American farmers hard. Himes was emotional when he said that Canadian troops had helped protect him during a congressional trip to Afghanistan and yet Trump imposed sanctions on that nation. “These are people who died side by side with us,” he said. Arora said U.S. companies can avoid paying more for Chinese imports by finding the same goods somewhere else. “There is a lot of competition around the world,” he said. Arora also said tariffs will eventually prod China and other nations into “fair trade” with the United States and that a longer view is warranted. As far as Syria, Himes said he told former Vice President Joe Biden, “in the situation room” that he would not support a congressional resolution allowing the Obama administration to use force against that nation. Former President Barack Obama asked Congress for that authorization when he determined Syria had crossed a “red line” by using chemical weapons. Arora said he would have voted for the resolution. Arora defended Trump’s decision to quit the pact, saying it was ineffective because China had not agreed to cut emissions. Again, he said “leverage” could be brought to bring China in line. “Let them see another year of what’s going on, they will come to the table,” he said. On Cuba, Himes said he supported a policy of trying to influence the island’s longstanding Communist society through engagement, tourism and limited trade. “I’m a great believer that if you meet an American, you realize what’s great about this country,” he said. Arora said he would tighten the nearly 60 year-old economic embargo against the nation by pressuring U.S. allies not to trade with Cuba. Himes said Trump should be tougher on Saudi Arabia in the wake of the suspected murder of a dissident journalist in its Turkish consulate. Arora said the worldwide dependence on Arabian oil precludes multilateral sanctions on the kingdom, but there could be global pressure put upon the nation to reform. Himes ended the debate saying the United States needed to lead by good example and the promotion of American values, not by force. 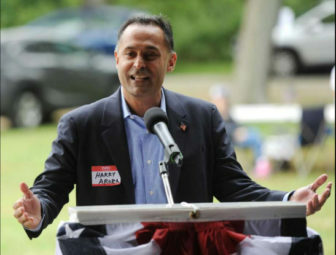 Arora used his closing remarks to promise to take no political action committee money and to limit his time in office to eight years. He also criticized Himes for failing to agree to more debates.